2018 wasn’t a pretty year for equity markets in general, and for emerging markets in particular. 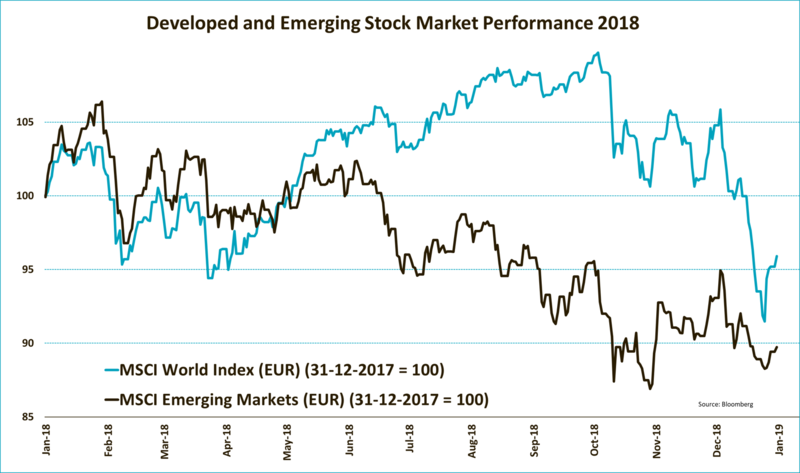 Global stocks fell 4.1% (in euros), whereas emerging market equities realized a negative return of more than 10% (also in euros). The strong determination of the US Federal Reserve to keep tightening monetary policy, combined with tepid GDP growth, a trade war and a spike in idiosyncratic risk (Argentina, Turkey) got the better of emerging market stocks. But what about the outlook for 2019? Can we expect a revival for the asset class? Obviously, a lot can happen in a year, but given recent developments in markets, the odds for a solid emerging market performance from here on are pretty decent. Gradually, the pieces of the puzzle are falling into place, which we will discuss in this month’s theme. Contrary to the messages of just a few months ago, the end of, or at least a pause in, US monetary tightening is now on the table. After a period of three years, during which the Federal Reserve has made nine rate hikes, Fed Chairman Jerome Powell has changed direction in his recent speeches. While indicating in October that interest rates had some way to go before reaching ‘neutral’ territory – the level that neither stimulates nor restrains economic growth – he more recently said that we are now “just below” that level. Also in its statements, the Fed has emphasized it will revert to data dependency, removing the autopilot of gradual increases, and letting market circumstances weigh in on future monetary policy. Hence, as current market circumstances aren’t particularly favorable, it seems likely that the Fed will take a break from further raising rates. This means that the difference between interest rates in the US and, for example, the Eurozone will not widen further, even though the ECB probably won’t get very far with its own rate hike plans before the next recession hits. And that means the US dollar – which is already overvalued – won’t necessarily strengthen, as the attractiveness of a currency largely depends on interest rate differences between two regions. 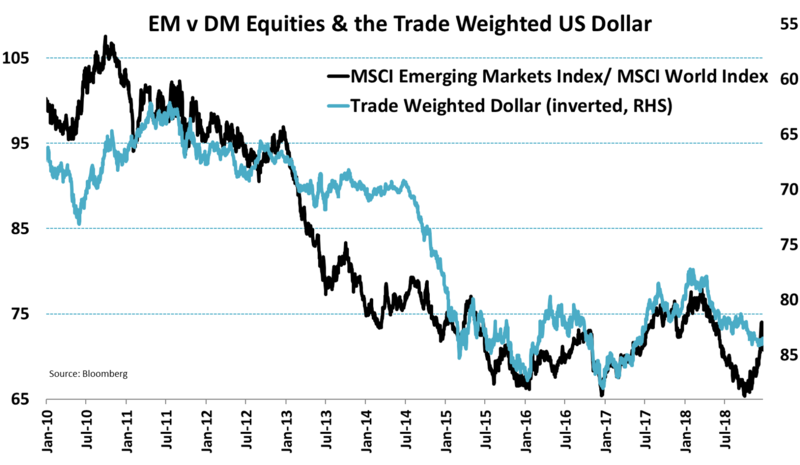 This is an important development for emerging markets, as a stronger US dollar often coincides with lackluster emerging market performance, as can be seen in the graph above. When the Fed raises interest rates and the US dollar rises, US growth slows, putting the brakes on imports from emerging countries. As emerging market economies are more open than the US economy, Fed tightening measures often hit these countries harder. In addition, rate hikes and a stronger dollar also translate into a reduction in global liquidity. Generally speaking, this tends to have a greater impact on asset classes at the end of the risk spectrum, such as emerging market stocks. Next to a pause in Fed tightening, we also expect the gap between GDP growth in emerging and developed countries to widen this year and next. It would be the first time since 2016 that the growth differential has widened. Historically, the gap between growth rates in emerging and developed markets has been one of the strongest drivers of emerging market equity performance relative to developed market equities. 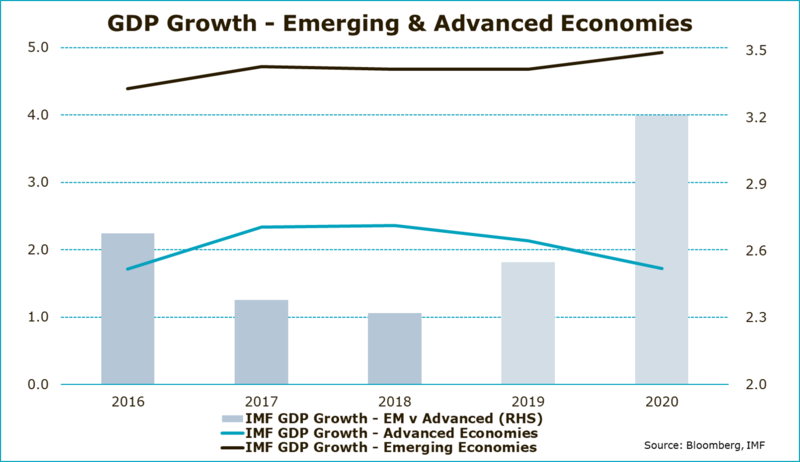 In the latest IMF growth forecasts, as shown in the chart above, growth in emerging countries is expected to accelerate somewhat, while growth in developed markets is seen easing in the coming years. Basically, both the GDP growth level in developed markets (which is above average) and emerging markets (which is below average) are expected to revert back to their long-term averages. While the divergence will be slow at first, the gap will likely widen to above 3% in 2020, the biggest since 2013. Already there are signs of a gentle shift in economic momentum. Manufacturing PMIs – traditionally among the best indicators for future economic growth – have started to converge. In December (and November), the gap between the Manufacturing PMI in developed and emerging markets was the smallest since October 2016. One thing to keep in mind here though is that economic momentum is still decreasing in both regions. So, what about the trade war between China and the US? As mentioned above, emerging markets are particularly vulnerable to a slowing of global trade. This is probably why they started to decouple from global equities from June onwards as the dispute escalated, although the effect of the currency crises in Argentina and Turkey, which also emerged at the same time, should not be ruled out. In recent months however, both parties seem to have refocused on de-escalation. A temporarily truce was declared: China lowered tariffs on some US imports, and President Trump offered some willingness to come to an agreement. What is equally important is that we believe that the current market conditions will force both China and the US to take a more constructive stance. For Trump, who has measured his success many times before by the performance of the equity markets, re-election in 2020 will become his main focus. Meanwhile, China is struggling to stimulate growth to counter the adverse effects of slower trade, which increases the odds of a trade deal. While that doesn’t necessarily mean the dispute is fully solved, since the discussion on intellectual property and technology rights is likely to linger for much longer, it does mean that the marginal effect on trade and GDP growth will decrease. When this happens, we expect emerging market stocks to be among the main beneficiaries. Finally, valuation could provide a catalyst, once some of the other pieces of the puzzle fall into place. The average P/E ratio (based on current earnings) of emerging market equities has dropped by as much as 30% as a result of the sell-off last year. As a result, the valuation for emerging stocks has fallen significantly below its long-term average. 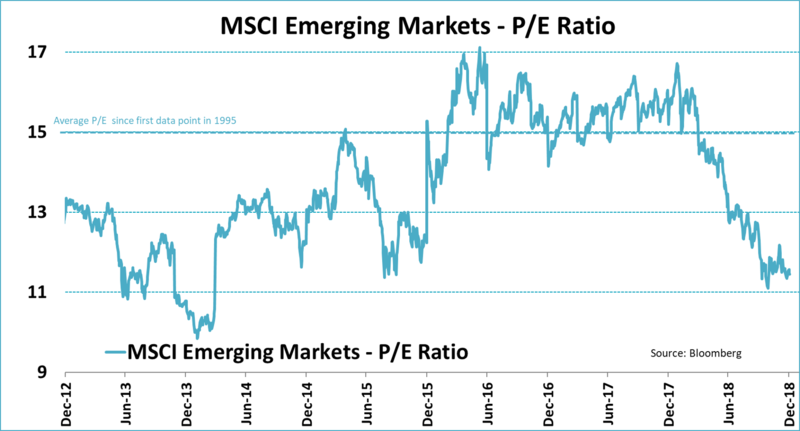 And even though the pattern in the valuation of developed market stocks is similar to those in emerging countries, especially outside the US, emerging equities also remain reasonably cheap on a relative basis. Although it is rarely the trigger for market reversals, we believe that the current level of valuation can become an important tailwind when thing starts to turn around. Obviously, our call that emerging markets could outperform this year is not without risks. If we do get a US recession this year – which we don’t expect at this point in time – emerging market equities are likely to fall further before they bottom out. In that case, earnings will probably decrease, removing the potential valuation catalyst as well. The same scenario is true if Chinese GDP growth slows further, meaning current stimulus is insufficient to accelerate growth. For many emerging countries, and not just in Asia, trade with China is far more important than with the US. The Federal Reserve also poses a risk if the US jobs market and wage growth forces the central bank to continue raising rates, putting renewed upward pressure on the US dollar. Still, recent developments make us believe that the odds of these risks materializing have decreased and not increased recently. A pause in the Fed hiking cycle, and/or any progress in the trade dispute between China and the US, would further substantiate this observation and pave the way for a solid return on emerging market equities going forward.